Located in the Ibaraki Prefecture, the house we are visiting today is within the Kantō region, on the main island of Honshu, Japan. 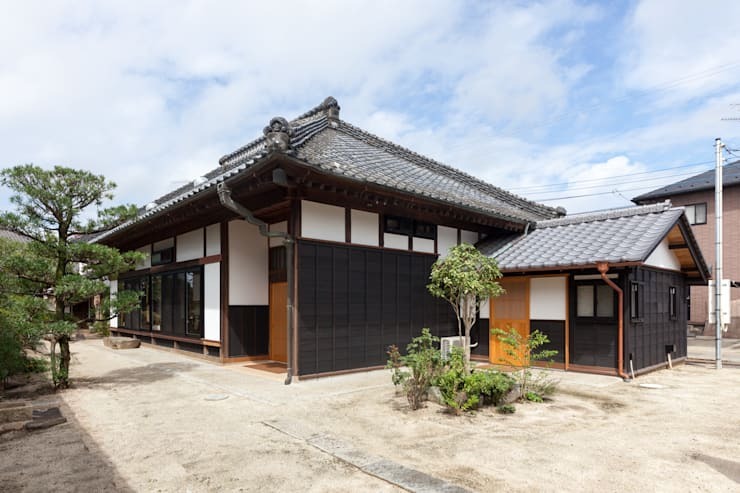 Built in 1928, but significantly damaged by an earthquake years later, this typically traditional home is a beautiful example of historic Japanese architecture. 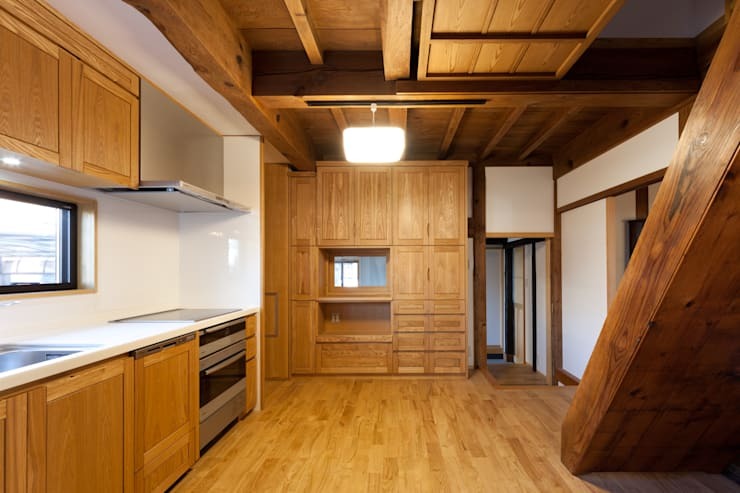 Situated in the old town of Tsukuba City, the dwelling was left for more than 20 years to fall into a state of disuse and neglect.Thankfully, the client engaged the team at Yoshida Architects Design Office, to radically transform and refurbish the spectacular property. One of the main concerns was to update the dwelling in a sympathetic and sophisticated way, combining over 100 years of tradition with a 21st century contemporary aesthetic. Luckily the project was an overwhelming success, with each element and feature carefully considered and implemented. If you would like to see more, check out the images below and journey into the past with a truly gorgeous and age-defiant abode. As we approach the home, it is clear that this is a striking and eye-catching property. The black tiled roof is traditional in its shape and form, exuding heritage elegance, and a traditional ambience. The façade is also black, and contrasts beautifully with the white panelling. This home has a real presence about it, exhibiting not only a welcoming vibe, but also an imposing and sophisticated aura. This home commands attention, and draws the occupant in, with its bold lines and daring atmosphere. On request from the client, important features of the house were retained, giving the dwelling a sense of history and heritage, while also ensuring the interior could be designed in a bright and airy fashion. More practical updates were introduced such as seismic reinforcement, protecting the house from natural disasters. Earthquake resistance was a crucial priority for the clients. The dwelling needed to be updated with adequate shear walls to protect the property from potential disaster. For those not in the know, shear walls are the structural system of the house. Comprised of braced panels, they counter the effects of the lateral load. Particularly effective for earthquake-proofing homes, shear walls can bear heavy seismic shift, and protect the structural integrity of the building. The craftsmanship of this house is undeniable, with each floor, wall, and ceiling perfectly finished to an extremely high level of quality and attention. Here, we see the gorgeous interior light gently filter through the shoji-style sliding paper walls. The space is elegant and incorporates the old perfectly with the new. Additionally, the house is constructed at a slight elevation from the ground. This traditional method of construction helps avoid moisture build up, and keeps the house dry and undamaged. The entrance to the home embraces an elegant Zen minimalism. 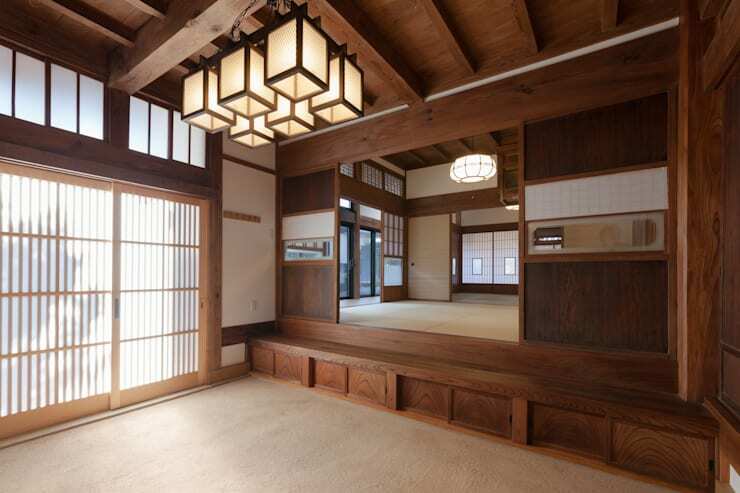 Furniture is sparse, and the spaces are open and vast.The house is surprisingly spacious, and encompasses sliding partitions, similar to the traditional method of fusuma. Fusuma are rectangular panels which can redefine interior spaces, and often act like doors. Unlike many Japanese houses, tatami mats haven't been included in this design. Instead the floor is covered with a sleek satin finish, adding to the neutral colour palette, while providing practicality, and low maintenance. Rich timber tones evoke a peaceful and somewhat sultry mood. The interior is captivating in its simplicity, while imparting a peaceful calmness within the beautifully decorated walls. Finally, a statement lighting fitting is seen within the space. Fashioned from a similar material to the shoji walls, the rice paper offers a warm and welcoming glow. The kitchen area is modern and stylish. Featuring all the necessary appliances and an abundance of storage space, this room is unlike any other traditional Japanese kitchen. However, in updating the home, the kitchen needed to function as a practical and liveable space. This walnut timber space allows for a certain level of comfort, without sacrificing style or elegance. We once again see the timber trusses, and the exposed wood ceiling. The room is surprisingly bright, and offers a cohesive design to accompany the other domestic living zones. 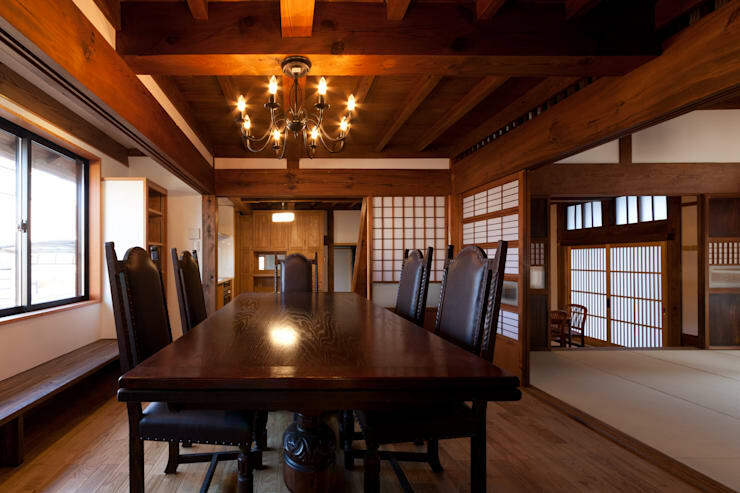 Within the dining room we see elements of the historic Japanese housing, paired with more modern amenities and inclusions. Instead of the traditional dining spaces that encompassed tatami mats with zabuton cushions for sitting, the room is replete with a contemporary dining table and chairs. Unlike other traditional Japanese spaces, the room has employed antique furniture imported from Europe. Additionally, to complement the western aesthetic, this room also includes a chandelier, which highlights the gorgeously rich timber ceiling. The European ambience and atmosphere is highly evocative of the Japanese Meiji era, which ran from the late 19th century, to the first decade of the 20th century. The room values and respects tradition, but includes contemporary comforts and conveniences. Shoji walls constructed from rice paper beautifully bring natural light into the interior spaces. The soft filter of dappled illumination evokes a sense of relaxation and inner calm. The transformation of this dwelling has ensured the tradition of this history-rich abode will continue for decades to come, and embraces many of the original features and fixtures. 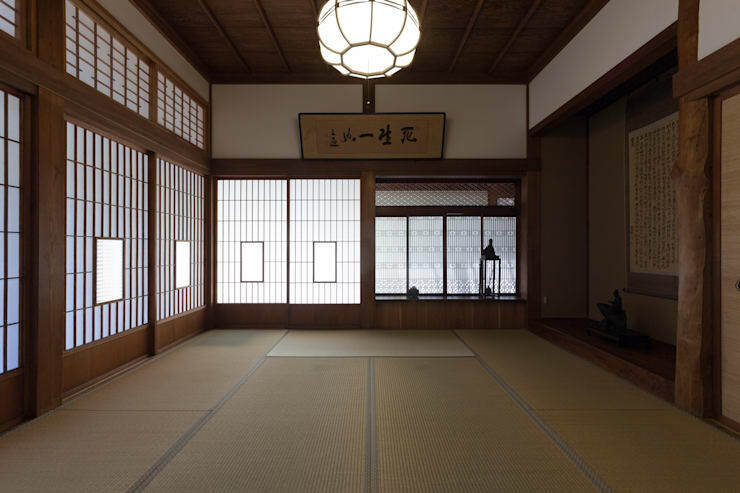 Within this large living space we see the gorgeous tatami mat area. Although tatami mats have become less common in Japanese households these days, they are still a beautiful and highly functional addition. As we take a look at the final room in our tour, we enter the bathroom. Replete with a sense of austerity, the room is sparse and perfunctory. However, it is far from boring, and it is actually the modest simplicity of the design that makes it all the more alluring. 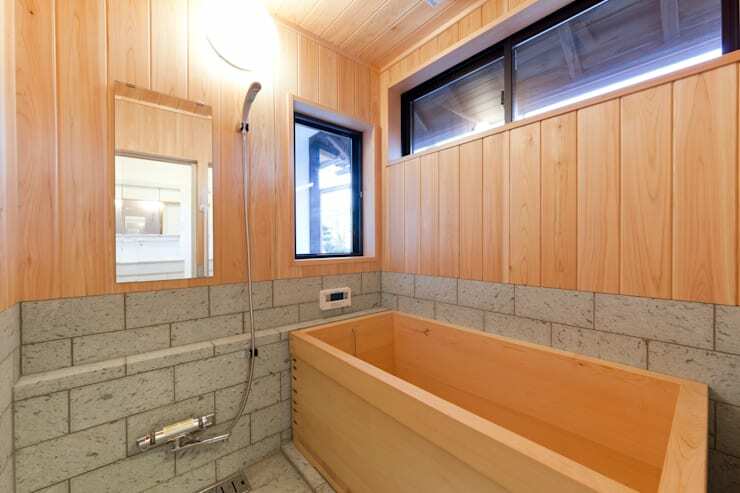 The walls are clad in timber, and match the large bath that sits below a horizontal glazing. Light is maximised in this space with plenty of windows, and the light is bright, yet avoids feeling overwhelmingly stark. Large building blocks are left unfinished, and juxtapose beautifully with the warm timber tones. This space is subtly serene, and evokes a sauna-esque aesthetic. 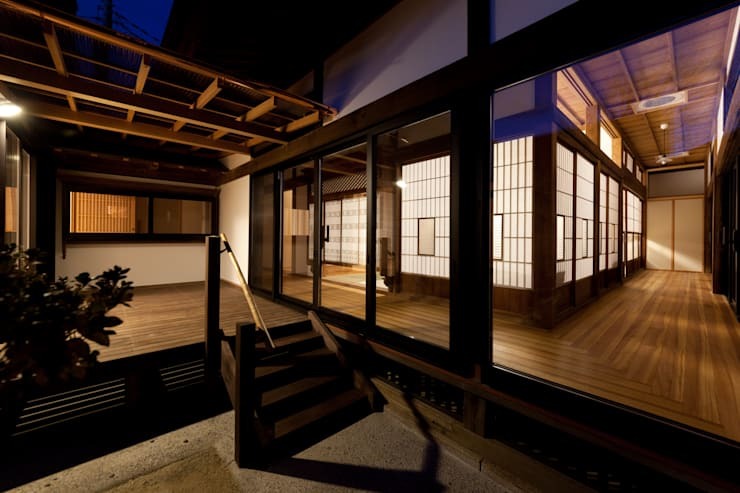 What did you think of the way the architects combined contemporary elements within the traditional Japanese home? Let us know in the comments below!